The same super-sizing project that created the Aeros Deluxe also produced an ultra-light version of the same dimensions. The Ultralight Deluxe has been designed using a variation of our patented ‘air-sprung’ cell technology. This has allowed us to create a larger single layer air pillow that doesn’t feel like a balloon when you’re at rest. For a paltry 130 grams you can now take a full sized pillow with you on your adventures, to give yourself a full sized sleep. Made from 20D laminated polyester to reduce bulk and weight. Air Sprung cell pattern design gives conformability and comfort. 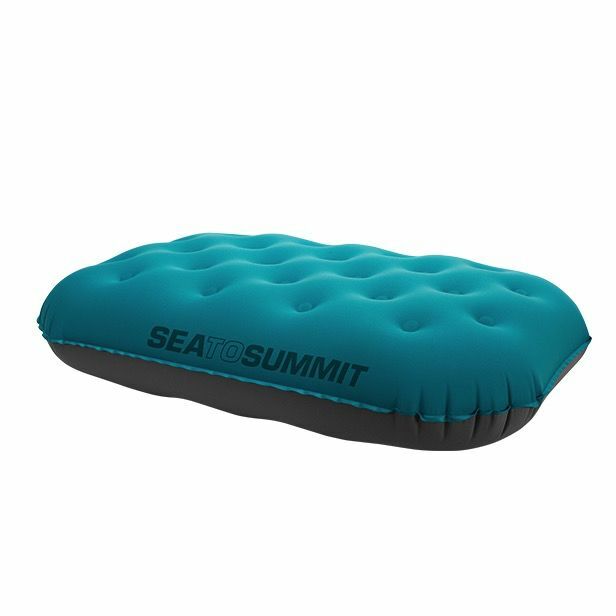 Features the Sea to Summit Multi-Function valve for ease of use. Available in Teal/Grey and Red/Grey. Weight: 130 grams Packed Size: 12 x 10 x 3cm Inflated Dimensions: 56 x 36 x 14cm Fabric: TPU Laminated 20D polyester stretch knit.